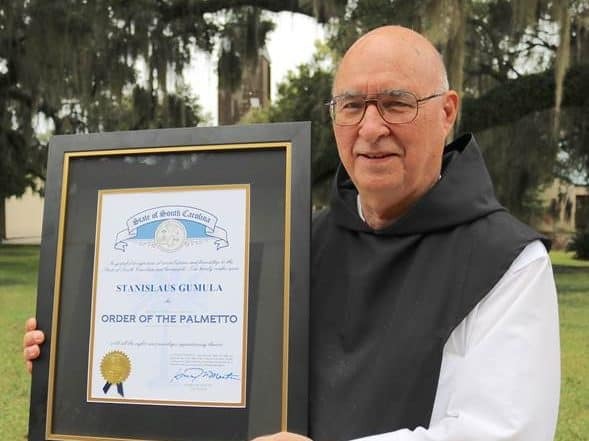 On November 11, 2018, former Charleston Mayor Joseph P. Riley, Jr. presented Fr. 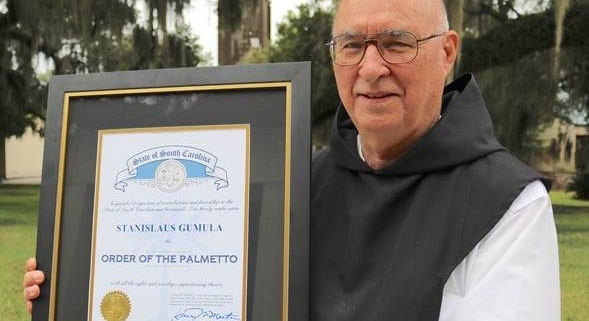 Stan the Order of the Palmetto, South Carolina’s highest honor given to one of its citizens. The award, given by Governor Henry McMaster, was presented to Fr. Stan at one of the monastery’s Founders’ Day events. I was totally overwhelmed at the award which I was given on Sunday. It was completely unexpected or anticipated. A lot of work went into it from many people. I am grateful to all of them. This award is really given to the Mepkin Community. I have been the abbot and the focal point for many of the things we have done over these past twelve years. But all that I have learned and all I have been able to do to somehow deserve such an award has come from the community. So please see this award as an award for each of us and enjoy it as such. It is a tremendous honor to be recognized by our State in such a way. The quote read by Mayor Riley was perfect. “Our desire and hope is to continue to show the compassionate face of Christ in the Lowcountry and that reconciliation between divergent voices and groups and between human communities and our natural surroundings and ecosystems is always possible.” This is what Mepkin is all about and it is wonderful to see it recognized by our State.